Exoplanets, planets in other solar systems, can orbit very close to their host stars. When the host star is much hotter than the sun, the exoplanet becomes as hot as a star. The hottest "ultra-hot" planet was discovered last year by American astronomers. Today, an international team led by researchers from the University of Geneva (UNIGE), who collaborated with theoreticians from the University of Bern (UNIBE), Switzerland, discovered the presence of iron and titanium vapours in the atmosphere of this planet. The detection of these heavy metals was made possible by the surface temperature of the planet, which reaches more than 4000 degrees. This discovery is published in the journal Nature. KELT-9 is a star located 650 light years from Earth in the constellation Cygnus (the Swan). With a temperature of over 10,000 degrees, it is almost twice as hot as the sun. This star is orbited by a giant gas planet KELT-9b, which is 30 times closer than the Earth's distance from the sun. Because of this proximity, the planet circles its star in 36 hours and is heated to a temperature of over 4,000 degrees. It's not as hot as the sun, but hotter than many stars. At present, we do not yet know what such a planetary atmosphere looks like, or how it can evolve under such conditions. The NCCR PlanetS researchers performed a theoretical study on the atmosphere of the planet KELT-9b. "The results of these simulations show that most of the molecules found there should be in atomic form, because the bonds that hold them together are broken by collisions between particles that occur at these extremely high temperatures," explains Kevin Heng, professor at the UNIBE. This is a direct consequence of the extreme temperature. Their study also predicts that it should be possible to observe gaseous atomic iron in the planet's atmosphere using current telescopes. The research team had observed this planet precisely as it was moving in front of its host star (i.e. during a transit). During transit, a tiny fraction of the light from the star filters through the planet's atmosphere, and analysis of this filtered light can reveal the chemical composition of the atmosphere. This is achieved with a spectrograph, which separates white light into its component spectrum. Iron vapour, if present, would leave a recognisable fingerprint in the spectrum of the planet. Using the HARPS-North spectrograph, built in Geneva and installed on the Telescopio Nazionale Galileo in La Palma, astronomers discovered a strong signal corresponding to iron vapour in the planet's spectrum. "With the theoretical predictions in hand, it was like following a treasure map," says Jens Hoeijmakers, a researcher at the Universities of Geneva and Bern and lead author of the study. "And when we dug deeper into the data, we found even more," he adds. The team also detected the signature of titanium in vapour form. This discovery reveals the atmospheric properties of a new class of so-called "ultra-hot Jupiter." However, scientists believe that many exoplanets have completely evaporated in environments similar to KELT-9b. Although this planet is probably massive enough to withstand total evaporation, this new study demonstrates the strong impact of stellar radiation on the composition of the atmosphere. Indeed, these observations confirm that the high temperatures on this planet break apart most molecules, including those containing iron or titanium. In cooler giant exoplanets, these atomic species are thought to be hidden within gaseous oxides or in the form of dust particles, making them hard to detect. This is not the case on KELT-9b. 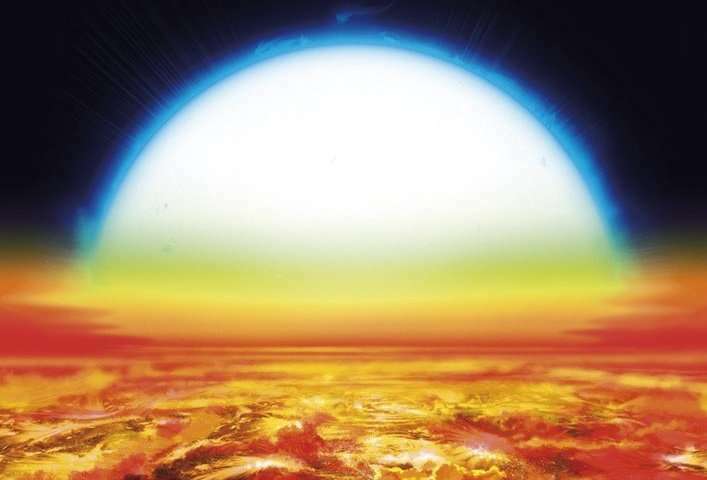 "This planet is a unique laboratory to analyze how atmospheres can evolve under intense stellar radiation," concludes David Ehrenreich, principal investigator with the UNIGE's FOUR ACES team.